Under a clear winter sky on Feb. 19, one of the new “catenary” lights above Third Avenue. At the risk of seeming to be preoccupied with the pot-like lights now hanging above the middle of Second and Third avenues, I got to wondering how much this wrinkle in the $8.5 million downtown Albany streetscape project had cost. It’s not as though anybody needed any more wires cluttering the view overhead, or that with the new “acorn” lights on the sidewalks the streets would be too dark for safe driving at night. 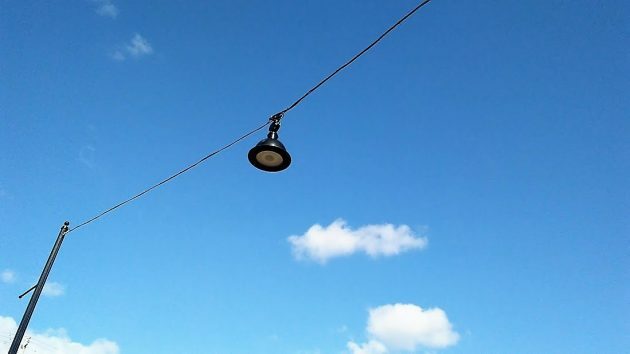 No, the consultants who included “catenary” lights in their recommendations for dressing up the streets in 2015 evidently thought this would add some kind of old-fashioned charm. Turns out you can look up the cost in the bids for the streetscape project available on the city’s website here. Emery & Sons, the low bidder who won the streetscape contract, put the price of these so-called “catenary” lights at $4,700 each. There are 14 of them, so the total of that item in the winning bid was $65,800. But the lights don’t hang there on their own. They hang from wires attached to banner poles. The bid itemized the banner poles at $8,600 each. There are, naturally, 28 banner poles in the project, two for every light. This brings the bid price of the poles to $246,400. Adding things up, then, for lights plus poles the city of Albany is paying $311,800 for that added bit of decoration of downtown streets and presumed period charm. What period, by the way? The first overhead light I could readily find in old pictures is on Page 54 of the fourth volume of “Remembering When,” the photo collection published by the late Robert Potts. The picture shows a solitary light hanging over the center of the intersection of First and Lyon — in 1912. The new lights above the center of Second Avenue downtown. Money is no object here in Albany! Welcome to our wasteful stupidity. While people across our world (and in our own country) go hungry and die of preventable diseases, we somehow justify spending over $311,000 for unnecessary luxuries. I can’t help but think that someday we will have to give an answer for our apathy. We need to recall the elected officials who thought squandering money like this was acceptable. This is not 1912. The lights that were on the streets, would have been sufficient. The elected officials think their only job is to spend money. When their job is to save it. Insane amount of money wasted on ugly lights. We have streets falling apart and the city spends money on this junk. No more taxes!!! Stop giving them money to waste. Notice on the side of the pot light plose, the Banner stubs, they are humungus, they hang over the side walks, guess what business are left won’t need signs anymore, because with banners that size you wont be able to see them anyway. The City certainly likes to spend our money on unnecessary items. IMHO, these lights for ambiance downtown and I barely noticeable. From now on I will vote no on other monies they want for projects. Hopefully other people will step up when it comes time to vote the council out. What another incredible WASTE of our tax dollars. Money for those ugly lights hanging in the middle of 2nd and 3rd might better have been spent on resurfacing 3rd on the east side. Spending of public funds has totally gotten out of hand, and started with those useless benches where one can sit and stare into empty shops. They do look pretty bad, I thought the first one I saw was a temporary construction light. Maybe we could bring back the sidewalks like they were when the lights fit in? Trees to deep, funny lights and still the streets are messed up. Even with the limited parking I am not seeing parking problems they said the carousel would cause. Maybe when the trees mature they will not be as conspicuous. So it is around $22,000 each for something that brings to mind what they used to hang in the barnyard for light to check on the cows. Let’s not forget that these ugly lights were paid for with dollars that CARA borrowed. CARA then skims property tax revenues from the overlapping taxing districts (ex: schools, county, city general fund, et al) to service the debt. The theory is that CARA’s debt & spend scheme will raise downtown property values by more than the $311K spent. And the overlapping taxing districts will reap the revenue benefit after CARA runs out of borrowing authority in about 10-20 years. There now, don’t you feel better about CARA and your city government? Few things happen so effortlessly as the foolish spending of other people’s money. Are you kidding me? Who made these decisions? Your “wonderful” city council, which includes the mayor, make all these decisions on spending money foolishly. I agree with above comments regarding vote no on taxes and vote out the council and mayor. Don’t forget the train station remodel at $11.3 million in 2006. Once again no matter what amount of money that is spent on “streetscapes” will make no difference until all building owners are made to keep up their buildings. One of your squishy liberals says: I agree with all of you (at least through 9:36 pm 2/20) except for the notion that a different City Council would help. It’s already as conservative as you’re likely to elect. Of course, if I didn’t have a major gripe over the clash between cutesy-old pastiche and modern car-riddled urbanity, I might not have joined-in. Vote no on any new taxes. Sounds great, I agree; but, if our present state legislators have their way (see pg 3, 2-19-18 DH) we won’t have that privilege. FYI they are pushing for constitutional amendments to allow cities to issue bonds to finance affordable housing projects plus making it affordable health care a constitutional right. Watch out – what will be next? A safe place to live? Medical treatment when you’re sick? It’s interesting what terrifies conservatives. I don’t live in the city so probably have no business commenting. But I drive thru most days. Those catenary lights are just as ugly as can be and the cost is outrageous! Also probably unnecessary. Think of all that could be done with $311,000 to make a difference. If the city had 311k to spend for road repair, how far might that go? It depends. Probably about a block or two. And they’re adding an Albany gas tax because they need money???? Are these people cognitively aware? IMHO, spending this much money on these lights is as ridiculous as the amount of money spent on those giant monstrosities around the Gateway/Springfield/I-5 area that they call art sculptures!!! I’m not going to weigh in or pile on. If this decision to hang these lights was necessary or decorative, then it was one street off. Third St is not as relevant for “downtown” mood. 1st and 2nd would have made more sense. Before you tee off on me, I operate a business on 3rd. Thanks for raising this issue Hasso. I actually like the idea of bringing the streetcar back. $311k, gee we could of filled a few more pot holes or even made some road repairs. But NO!!! Let’s put in period lights for a small portion of a growing city, in which an even smaller portion of the population visits.